For other people with the same name, see John Brunner. "Timescoop" redirects here. For the Doctor Who technology, see Time scoop. John Kilian Houston Brunner (24 September 1934 – 25 August 1995) was a British author of science fiction novels and stories. His 1968 novel Stand on Zanzibar, about an overpopulated world, won the 1969 Hugo Award for best science fiction novel, and the BSFA award the same year. The Jagged Orbit won the BSFA award in 1970. Brunner was born in 1934 in Preston Crowmarsh, near Wallingford in Oxfordshire, and went to school at St Andrew's Prep School, Pangbourne. He did his upper studies at Cheltenham College. He wrote his first novel, Galactic Storm, at 17, and published it under the pen-name Gill Hunt. He did not start writing full-time until 1958, some years after his military service. He served as an officer in the Royal Air Force from 1953 to 1955. He married Marjorie Rosamond Sauer on 12 July 1958. Brunner had an uneasy relationship with British new wave writers, who often considered him too American in his settings and themes. He attempted to shift to a more mainstream readership in the early 1980s, without success. Before his death, most of his books had fallen out of print. Brunner accused publishers of a conspiracy against him. But he was known to be difficult to deal with (his wife Marjorie Brunner had handled his publishing relations before she died). Brunner's health began to decline in the 1980s and worsened with the death of his wife in 1986. He remarried, to Li Yi Tan, on 27 September 1991. He died of a heart attack in Glasgow on 25 August 1995, while attending the World Science Fiction Convention there. At first writing conventional space opera, Brunner later began to experiment with the novel form. His 1968 novel Stand on Zanzibar exploits the fragmented organizational style that American writer John Dos Passos created for his USA trilogy, but updates it in terms of the theory of media popularised by Canadian academic Marshall McLuhan, a major cultural figure of the period. The Jagged Orbit (1969) is set in a United States dominated by weapons proliferation and interracial violence. Its 100 numbered chapters vary in length from a single syllable to several pages in length. The Sheep Look Up (1972) depicts ecological catastrophe in America. Brunner is credited with coining the term "worm" and predicting the emergence of computer viruses in his 1975 novel The Shockwave Rider, in which he used the term to describe software which reproduces itself across a computer network. Together with Stand on Zanzibar, these novels have been called the "Club of Rome Quartet", named after the Club of Rome, whose 1972 report The Limits to Growth warned of the dire effects of overpopulation. Brunner's pen names include K. H. Brunner (Kilian Houston Brunner), Gill Hunt, John Loxmith, Trevor Staines, Ellis Quick, Henry Crosstrees Jr., and Keith Woodcott. In addition to his fiction, Brunner wrote poetry and published many unpaid articles in a variety of venues, particularly fanzines. He also published 13 letters to the New Scientist and an article about the educational relevance of science fiction in Physics Education. Brunner was an active member of the organisation Campaign for Nuclear Disarmament and wrote the words to "The H-Bomb's Thunder", which was sung on the Aldermaston Marches. He was a linguist, translator,[further explanation needed] and Guest of Honour at the first European Science Fiction Convention Eurocon-1 in Trieste in 1972. John Brunner wrote the screenplay for the science fiction film The Terrornauts (1967) by Amicus Productions. Two of his short stories, "Some Lapse of Time" and "The Last Lonely Man", were adapted as TV plays in the BBC science fiction series Out of the Unknown, in series 1 (1965) and series 3 (1969), respectively. Secret Agent of Terra, Ace F-133 (1962); revised as The Avengers of Carrig, Dell (1969). Book 1 of the "Zarathustra Refugee Planets" series. The Dreaming Earth, Pyramid F-829 (1963); revision of 1961 serial "Put Down This Earth"
Castaways' World, Ace F-242 (1963); revised as Polymath, DAW UQ1089 (1974). Book 2 of the "Zarathustra Refugee Planets" series. The Repairmen of Cyclops, Ace M-115 (1965). Book 3 of the "Zarathustra Refugee Planets" series. The Crutch of Memory, Barrie & Rockliff (1964). Conventional novel set in Greece. Wear the Butcher's Medal Pocket (1965). Mystery set in Europe featuring neo-Nazis. Black Is the Color, Pyramid (1969, republished in 2015). Horror fiction about the "swinging London" underground in the 1960s. The Devil's Work, W. W. Norton & Company (1970). Centres on a modern-day Hellfire Club. The Great Steamboat Race, Ballantine (1983). Historical fiction based on an actual event. The Days of March, Kerosina (1988). Novel about the early days of the Campaign For Nuclear Disarmament. ^ a b c Tuck, Donald H. (1974). The Encyclopedia of Science Fiction and Fantasy. Chicago: Advent. pp. 70–72. ISBN 0-911682-20-1. ^ Smith, Jad, John Brunner, University of Illinois Press. ^ a b "Obituary of John Brunner". Daily Telegraph. 25 September 1995. p. 23. ^ Bisson, Simon (13 July 2012). "Science fiction: Why it's a must read for IT pros". ZDnet. CBS Interactive. Retrieved 29 March 2013. ^ John Brunner, "The educational relevance of science fiction", Physics Education (1971), volume 6, pp. 389–391. ^ "Max Curfew", Spy Guys and Gals. ^ a b Thomas D. Clareson, ed. (1978), Voices for the Future: Essays on Major Science Fiction Writers, Volume 2, Popular Press. ^ John O'Neill, "Vintage Treasures: The Great Steamboat Race by John Brunner", Black Gate, 11 June 2014. 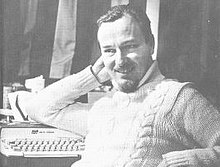 ^ "The John Brunner Archive". University of Liverpool Library, Special Collections and Archives. Archived from the original on 25 January 2015. Retrieved 24 January 2015. ^ "Лаборатория Фантастики". Fantlab. Retrieved 24 January 2015.